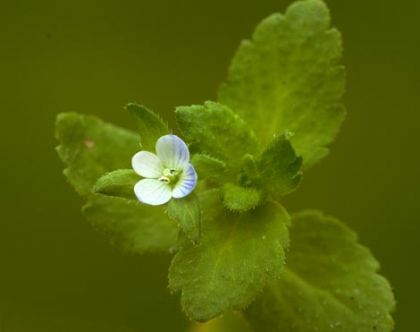 One of a number of Speedwells, this species is not found as commonly as it once was and sadly is decreasing. It's a prostrate perennial which can be found on bare, disturbed ground. 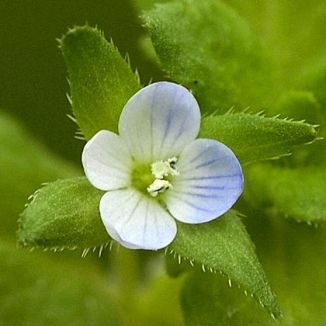 Its solitary four-lobed flowers (4-6mm across) are pale blue or white, always with a white lower lip and are borne on short stalks which arise in the leaf axils. They bloom from April to September. The downy oval leaves are short-stalked, bright green and toothed, the lower leaves are opposite. This plant was introduced into Ireland and it belongs to the family Plantaginaceae. My first record of this wildflower is in Gibletstown, Co Wexford in 2005 and I photographed it in 2007 in the same place.